U.S. Sen. Daniel Inouye, left, said the U.S. Pacific Command's new training facility on Ford Island should be named after Adm. Thomas Fargo, who pushed for its creation while head of all U.S. forces in the Pacific. 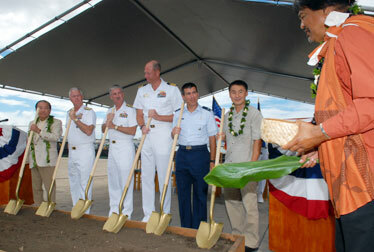 Inouye was joined last week at groundbreaking ceremonies by Adm. Timothy Keating, current Pacific Forces commander; Rear Adm. Townsend Alexander; Capt. David Mauer; Col. Mike Duvall; and contractor Fooney Freestone, head of Nan Inc. When the nearly mile-long causeway connecting Ford Island with the Halawa side of Pearl Harbor was proposed, it was described as "a bridge to nowhere," U.S. Sen. Daniel Inouye recalls. However, completion of that bridge in 1998 has led to a rebirth of the island, once called Mokuumeume by ancient Hawaiians. Last week, one major Ford Island construction project was completed while another one was kicked off. Inouye, who was instrumental in finding crucial federal dollars to fund the projects, attended both ceremonies. The first project was the dedication of a $14 million Navy conference center and the upgrading of the island's infrastructure while the other was the groundbreaking for a $20 million Pacific Warfighting Center that would connect the military here with simulation training facilities around the world. Inouye suggested that the Pacific Warfighting Center should be named after Adm. Thomas Fargo, who as commander of all U.S. forces in the Pacific from 2002 to 2005 pushed for "a place where experts from all commands could get together to prepare and equip themselves for war." Inouye said it was Fargo who impressed upon him the importance of the Pacific as being "equally if not more dangerous than the Atlantic" with problems in the Philippines, Indonesia and China. 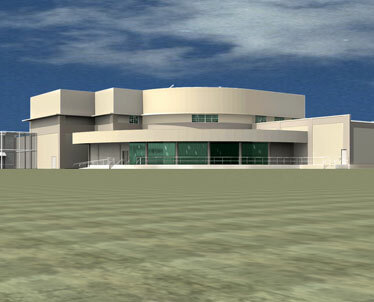 An artist's rendering shows a two-story building that will house the Pacific Warfighting Center on Ford Island. The training facility will connect war simulation facilities around the world. It is expected to be completed in 2009. Planning for the 34,000-square-foot, two-story complex started seven years ago and will be built using traditional military construction appropriations. It will be competed by July 2008, replacing a 7,000-square-foot facility at Camp Smith, which initially was a hospital morgue. "We need to train like we fight, and this facility will allow us to do just that," said Adm. Timothy J. Keating, current head of the U.S. Pacific Command. "The more we can simulate real-world conditions and allow our commanders to respond in real time, the greater success we'll have on the battlefield or responding to humanitarian emergencies." It was Inouye who authored legislation that allowed the Navy to sell or lease underutilized properties, like Ford Island, and to use the proceeds to develop the island for military housing and commercial use. On Tuesday, the Navy, with private developers Hunt Development Group and Fluor Federal Services (now working as Ford Island Properties), marked the completion of phase one of the Navy's Ford Island Master Development Project. Steve Colon, president of Hunt Development, said the project marks the start of Ford Island's revitalization. That included $83.9 million of upgrades to the electrical, telecommunications, sewage and roads on Ford Island. And $14 million was spent to refurbish Building 89 -- Ford Island's 400-seat movie theater, which is on the National Register of Historic Places. Rick McDowell, project manager, said construction of the Ford Island Theater was started in 1941. "When the Japanese attacked, they had just broken ground and there were just putting in the pilings," McDowell said. Work was completed in 1943 and the building was used as a theater until it was closed in 1980, said Mike McDavitt, facilities manager at Pearl Harbor. The new conference center includes 21,000 square feet with a conference capacity of nearly 675 people. The ground floor can be configured into a ballroom with a capacity of 600. The second floor features three meeting rooms, one board room and one business center capable of holding 75 people. McDavitt said all the rooms have large video monitors that are connected to a central control room. Video conference capabilities will be available in the board room, McDavitt added. Until recently, the Navy had to rely on aging facilities at Lockwood Hall and Sharkey Theater at Pearl Harbor's submarine base, McDavitt said. Rear Adm. Townsend Alexander, commander of Navy Region Hawaii, hailed Tuesday's event as "the rebirth of Ford Island." Work on the Ford Island master plan began in 2004 under which Ford Island Properties was granted a 65-year lease. Proceeds to develop Ford Island come from money generated by the private development of the island and the renovation and management of 2,000 housing units at Iroquois Point and Kalaeloa. The next phase includes the construction of a 170-acre, three-story apartment community, consisting of 300 two-bedroom apartments; a second 17-acre, private residential community consisting of 130 two-story townhouses with two- and three-bedroom units, and a new waterfront promenade commercial center. As Inouye remarked last week, the bridge, named after former Pacific Fleet commander Adm. Bernard Clarey, is no longer the bridge to nowhere.